Marine and Navy are Applicable. An unaltered photocopy of your DD-214, WD AGO, NAVPERS, NG or other military issued document clearly displaying your award of the Distinguished Flying Cross. Contact The War Library if you do not have a DD-214, WD AGO, NAVPERS, NG or other Report of Separation: 1-562-422-4100 (Pacific Time Zone). The Distinguished Flying Cross was established by Act of Congress (Public Law 446, 69th Congress), approved July 2, 1926, and implemented by Executive Order 4576 signed by President Calvin Coolidge on January 28, 1927. This law was amended by Section 4 of Public Law 234 (approved on July 30, 1937) to permit the Coast Guard to award the Distinguished Flying Cross in its own right (members of the Coast Guard could previously receive the Distinguished Flying Cross only "while serving with the military or naval forces"). Public Law 234 was implemented by Executive Order 7786 signed by President Franklin D. Roosevelt on January 8, 1938. The Distinguished Flying Cross has been in effect since July 3, 1927. However, Executive Order 4601 signed by President Hoover on March 1, 1927, provided that for "any act of heroism or extraordinary achievement performed on or before July 2, 1926, the Distinguished Flying Cross shall not be awarded after July 2, 1929, nor unless the recommendation therefore shall have been made on or before July 2, 1928." The Distinguished Flying Cross may be awarded to military members who, while serving in any capacity with the Armed Forces, distinguish themselves by heroism or outstanding achievement while participating in aerial flight. To be awarded for heroism the act must involve voluntary action in the face of danger and be well above the actions performed by others engaged in similar flight operations. If awarded for extraordinary achievement, it must have resulted in an accomplishment so exceptional and outstanding as to clearly set the individual apart from his or her comrades or from other persons in similar circumstances. Awards of the Distinguished Flying Cross by the Army are only made to recognize single acts of heroism or extraordinary achievement and not to recognize sustained operational activities against an armed enemy. The Distinguished Flying Cross is worn after the Legion of Merit and before the Soldier's Medal, Navy and Marine Corps Medal, Airman's Medal, or Coast Guard Medal. Additional awards are denoted by oak leaf clusters. Additional awards are denoted by gold stars five-sixteenths of an inch in diameter, and the Combat Distinguishing Device may be authorized for qualifying service rendered after April 4, 1974. The Distinguished Flying Cross was designed by Arthur E. DuBois and Elizabeth Will, both of the Army's Institute of Heraldry. The first recipient of the Distinguished Flying Cross was Captain (U.S. Army Reserve) Charles A. Lindbergh, who received medal number 1 on June 11, 1927, from President Calvin Coolidge in a special ceremony on the grounds of the Washington Monument. However, the earliest act for which a Distinguished Flying Cross was awarded occurred much earlier. By Act of Congress (Private Law 313) approved December 18, 1928, Wilbur and Orville Wright were awarded the Distinguished Flying Cross for the first manned flight at Kitty Hawk, North Carolina on December 17, 1903. On a bronze cross pattee one and a half inches across, a four-bladed propeller one and eleven-sixteenths inches across the blades; in the re-entrant angles, rays forming a one inch square. The cross is suspended by a plain, straight suspender. The reverse is blank, leaving space for engraving the recipient's name. The ribbon is predominantly blue, with a narrow band of red bordered by white in the center. The edges of the ribbon are outlined with equal bands of white inside blue. This medal is awarded to any officer or enlisted man of the Armed Forces of the United States who shall have distinguished himself in actual combat in support of operations by "heroism or extraordinary achievement while participating in an aerial flight, subsequent to November 11, 1918." The decoration may also be given for an act performed prior to November 11, 1918, when the individual has been recommended for, but has not received the Medal of Honor, Distinguished Service Cross, Navy Cross, or Distinguished Service Medal. The Distinguished Flying Cross, authorized by an Act of Congress of July 2, 1926 (amended by Executive Order 7786 on January 8, 1938), was awarded first to Captain Charles A. Lindbergh, of the U.S. Army Corps Reserve, for his solo flight of 3600 miles across the Atlantic in 1927, a feat which electrified the world and made "Lindy" one of America's most popular heroes. The first D.F.C. to be awarded to a Navy man was to Commander Richard E. Byrd, of the U.S. Navy Air Corps, on May 9, 1926, for his exciting flight to and from the North Pole. Both these famous aviators also received the Medal of Honor with the Distinguished Flying Cross. The Aviatrix Amelia Earhart also received the Distinguished Flying Cross. Hers was the only such award, as an executive order on March 1, 1927, ruled that D.F.C. should not be conferred on civilians. During wartime, members of the Armed Forces of friendly foreign nations serving with the United States are eligible for the D.F.C. It is also given to those who display heroism while working as instructors or students at flying schools. The Distinguished Flying Cross was designed by Elizabeth Will and Arthur E. DuBois. It is a bronze cross pattee, with rays between the arms of the cross. On the obverse is a propeller of four blades, with one blade in each arm of the cross and in the re-entrant angles of the cross are rays which form a square. The cross is suspended by a recatgular-shaped bar and centered on this is a plain shield. The reverse is blank and suitable for engraving the recipients name and rank. The ribbon has a narrow red center stripe, flanked on either side by a thin white stripe, a wide stripe of dark blue, a narrow white stripe and narrow dark blue at the edge of the ribbon. Subsequent awards of the Distinguished Flying Cross are indicated by oak-leaf clusters for Army and Air Force personnel and by additional award stars for members of the Naval services. An example of the gallantry for which the Distinguished Flying Cross is awarded took place on the morning of August 31, 1969 in Vietnam. Captain Francis J. Cuddy, USMC a Helicopter pilot, was assigned the mission of assisting in the extraction of an Army Special Forces reconnaissance team heavily engaged in combat with a large North Vietnamese Army deep in an mountainous area under the enemy's complete control. Captain Cuddy, undaunted by the heavy volume of hostile fire directed at his aircraft, directed other helicopters into the area, moved his aircraft into treetop level and delivered repeated rocket and strafing runs on the enemy positions. As a result of his devastating attacks, the hostile fire was suppressed and sufficiently to enable the transport helicopters to safely extract the reconnaissance team. The citation for his award went on the say ". . .Captain Cuddy's courage, superior airmanship, and unwavering devotion to duty in the face of personal danger were instrumental in accomplishing this hazardous mission and were in keeping with the highest traditions of the Marine Corps and of the United States Naval Service." Captain Cuddy was also awarded the Silver Star, three Distinguished Flying Crosses, Commendation Medal with Combat "V," the Purple Heart and forty eight Air Medals During his tour of duty in Vietnam. 1. Description: A bronze cross patee on which is superimposed a four-bladed propeller, 1 11/16 inches in width. Five rays extended from the reentrant angles, forming a one-inch square. The medal is suspended from a rectangular shaped bar. 2. Ribbon: The ribbon is 1 3/8 inches wide and consists of the following stripes: 3/32 inch Ultramarine Blue 67118; 9/64 inch White 67101; 11/32 inch Ultramarine Blue 67118; 3/64 inch White 67101; center stripe 3/32 inch Old Glory Red 67156; 3/64 inch White 67101; 11/32 inch Ultramarine Blue 67118; 9/64 inch White 67101; 3/32 inch Ultramarine Blue 67118. 3. Criteria: The Distinguished Flying Cross is awarded to any person who, while serving in any capacity with the Armed Forces of the United States, distinguishes himself by heroism or extraordinary achievement while participating in aerial flight. The performance of the act of heroism must be evidenced by voluntary action above and beyond the call of duty. The extraordinary achievement must have resulted in an accomplishment so exceptional and outstanding as to clearly set the individual apart from his comrades or from other persons in similar circumstances. Awards will be made only to recognize single acts of heroism or extraordinary achievement and will not be made in recognition of sustained operational activities against an armed enemy. a. Decoration (regular size): MIL-D-3943/15. NSN 8455-00-269-5748 for decoration set. NSN 8455-00-246-3826 for individual display medal. b. Decoration (miniature size): MIL-D-3943/15. NSN 8455-00-996-5006.
c. Ribbon: MIL-R-11589/47. NSN 8455-00-252-9967.
d. Lapel Button (metal replica of ribbon): MIL-L-11484/11. NSN 8455-00-253-0807. 5. Background: a. The Distinguished Flying Cross was established in the Air Corps Act (Act of Congress, 2 July 1926, Public Law No. 446, 69th Congress). This act provided for award "to any person, while serving in any capacity with the Air Corps of the Army of the United States, including the National Guard and the Organized Reserves, or with the United States Navy, since the 6th day of April 1917, has distinguished, or who, after the approval of this Act, distinguishes himself by heroism or extraordinary achievement while participating in an aerial flight." b. Various designs from the U.S. Mint, commercial artists, and the Office of the Quartermaster General, were submitted to the Commission of Fine Arts and on 31 May 1927. The Commission approved a design submitted by Mr. Arthur E. Dubois and Miss Elizabeth Will. c. Initial awards of the Distinguished Flying Cross were made to persons who made record breaking long distance and endurance flights and who set altitude records. The Secretary of War authorized the first Distinguished Flying Cross to Captain Charles A. Lindbergh in a letter dated 31 May 1927. With the support of the Secretary of War, the Wright Brothers retroactively received the Distinguished Flying Cross. This award required a special Act of Congress, since the law precluded award to civilians. d. The current statutory requirements for award of the Distinguished Flying Cross to Army personnel is contained in Title 10, U.S.C., Section 3749; Section 6245 for Navy personnel; and Section 8749 for Air Force personnel. Enlisted personnel may be entitled to a 10% increase in retired pay under Title 10, U.S.C., Section 3991, when credited with heroism equivalent to that required for the award of the Distinguished Service Cross. e. Order of precedence and wear of decorations is contained in Army Regulation 670-1. Policy for awards, approving authority, supply, and issue of decorations is contained in Army Regulation 600-8-22. Source: The provisions of Executive Order 4601 of Mar. 1, 1927, do not appear in the Federal Register system. 1. a. Subject to the other special conditions prescribed in the law, the following classes of persons are eligible for the award of the distinguished flying cross: (1) All members of the Army, Navy, Marine Corps, and Coast Guard of the United States, while participating in an aerial flight, as part of the duties incident to such membership; (2) All members of the National Guard not in Federal service, the Organized Reserves, the Officers' Reserve Corps, the Enlisted Reserve Corps, the Naval Reserves and the Marine Corps Reserves, not on active duty, while participating in an aerial flight as part of the duties incident to such membership; (3) Members of the military, naval or air forces of foreign governments while serving with the military or naval forces of the United States and while participating in an aerial flight. b. Civilians are not eligible for the award of the distinguished flying cross. 2. The Secretary of War, the Secretary of the Navy, and the Secretary of the Treasury, acting for the President, will make the award of the distinguished flying cross to eligible persons in their respective departments. 3. 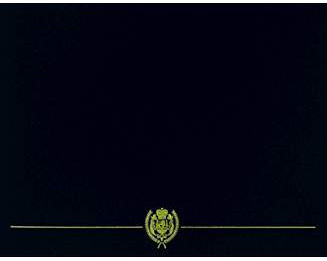 The initial recommendation for the award of the decoration may be made by any officer having information of the facts. 4. A recommendation must be based upon the statement of a person who has personal knowledge concerning the act of heroism or extraordinary achievement or who was an eye-witness thereto, preferably the immediate commander. Such act or achievement must be described specifically and in detail. When the recommendation is made by a person who was an eye-witness to the act or achievement or who has personal knowledge thereof, that fact must be stated. When the recommendation is made by a person who was not an eye-witness to the act or achievement or who does not have personal knowledge thereof, the testimony of at least two persons who were eye-witnesses or who have personal knowledge thereof, and who so describe themselves, must accompany the recommendation. Written testimony will be in the form of recognitions or affidavits. 5. Each recommendation for the award of the decoration will show, in case of the person who is being recommended, the exact status of that person at the time he displayed the heroism or extraordinary achievement upon which the recommendation is based, and will contain a specific statement that the entire service of that person, since the time he distinguished himself, has been honorable. 6. When a recommendation is supported by an official record that fact will be stated, and there will be included in the recommendation such information as will enable a prompt and certain identification of such record. 7. Each recommendation will be submitted separately and forwarded through regular channels with the views and recommendations of each commander indorsed thereon. 8. (a) For any act of heroism or extraordinary achievement performed on or before July 2, 1926, the Distinguished Flying Cross shall not be awarded after July 2, 1929, nor unless the recommendation therefor shall have been made on or before July 2, 1928. For any such act or achievement performed subsequent to July 2, 1926, the said decoration shall not be awarded after more than three years from the date of such act or achievement, nor unless the recommendation therefor shall have been made at the time of such act or achievement or within two years thereafter: Provided, that for any such act or achievement performed between December 7, 1941, and September 2, 1945, the said decoration may be awarded not later than May 2, 1952, in any case in which the written recommendation therefor shall have been made on or before May 2, 1951: And provided further, that for any such act or achievement performed during the period commencing September 3, 1945, and ending at twelve o'clock noon, December 31, 1946, the date of the termination of hostilities of World War II, as proclaimed by Proclamation No. 2714 of December 31, 1946, the said decoration may be awarded in any case in which the recommendation therefor shall have been made not later than June 30, 1947. (b) In any case in which a recommendation for the award of the Distinguished Flying Cross has been lost and such recommendation is alleged to have been made within the applicable period of time prescribed by subdivision (a) of this paragraph, the recognition of an officer or the affidavit of an enlisted man to the effect that the recommendation was made within such applicable period of time and forwarded through official channels, accompanied by a statement of the substance of the recommendation, or preferably a copy thereof, shall be accepted, and the case considered on its merits. 9. In case an individual who distinguishes himself shall have died before the making of the award to which he may be entitled, the award may nevertheless be made and the cross, bar, or other device presented to the representative of the deceased in the following order: widow (provided she has not remarried), eldest son, eldest daughter, father, mother, eldest brother, eldest sister, eldest grandchild. 10. Not more than one of the several decorations authorized by Federal law will be awarded for the same act of heroism or extraordinary achievement. 11. 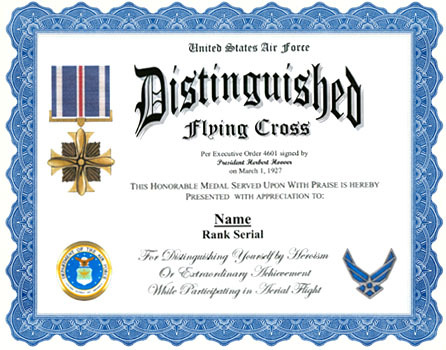 Whenever the distinguished flying cross, bar, or other suitable device shall have been lost, destroyed, or rendered unfit for use, without fault or neglect on the part of the person to whom it was awarded, such cross, bar, or other device shall be replaced without charge therefor by the department by which the award was made. 12. The Secretary of War, the Secretary of the Navy, and the Secretary of the Treasury may promulgate, for the service pertaining to their respective departments, such additional regulations, supplementary to these regulations and not in conflict therewith, as they may deem proper, and may from time to time alter, modify, or rescind such regulations. Editorial note: Executive Order 4601 was further amended by Executive Order 7962 of Aug. 22, 1938, to provide for the award of the decoration to a certain member of the U.S. Coast Guard. The Executive order was not printed in the Federal Register. 1 Editorial note: Executive Order 4601 was not given a formal title.